Always attention to detail, technical skills, passion in our work and great attention to customer needs are the strengths that have allowed us to excel in the field of sale of Airbrush Kit "BOTTICELLI". Consultando il catalogo di Aerografando you will immediately notice how vast it is and how diversified the model range is Kustom, you will find the best Airbrush Kit "BOTTICELLI" offers at the best prices on all Airbrush Kit "BOTTICELLI" of the brands Aerografando. Excellent "BOTTICELLI" airbrush kit composed of high quality brand products. Portable silent compressor with tank, pressure regulator, anti-condensation filter and automatic ON/OFF. N.9 primary colors AERO COLOR SCHMINCKE 28ml in the following colors: 101 (Supra White), 202 (Primary Yellow), 302 (Carmine), 304 (Primary Magenta), 402 (Ultramarine), 405 (Basis Cyan), 500 ( Phtalo Green), 602 (Brown Brazil), 702 (Black). Airbrush colors of extraordinary brilliance and shine. Suitable for almost all the funds, they adhere perfectly to paper, cardboard, non-absorbent substrates, films, hard plastics, canvas and metal, after appropriate preventive treatment. Schmincke Aero Color colors have very high pigmentation and maximum resistance to light (class: 4/5 stars). Dilutable with water and waterproof after drying can be applied with airbrush, nib, rapidograf and brush. Schmincke colors have a unique feature in the airbrush market, the result of years of research and development: thanks to the Shake & Spray system, the colors at rest thicken (to avoid the deposit of pigments) and, when shaken, they return fluids and ready to use. Here is the exciting new Volume "Airbrush 2.0 - The Icons", to which the great Italian contemporary illustrators give life, telling "our time" through the portraits of the icons that characterize it: from Pope Francis to the Hollywood star Marilyn Monroe, from Valentino Rossi to the stars of the song as Madonna and Elvis Presley or the very Italian Branduardi. Each using different styles and interpretative ways, demonstrating the enormous expressive quality that the airbrush possesses, comparable to the artistic techniques. A completely renewed volume, full of new ideas and with new emerging artists alongside the guru of the Italian airbrush, known all over the world. Many new step by step and a precious guide to the newest applications of this technique, with particular attention to its use in the world of work, to make it a winning tool in many professions. A volume suitable for those who want to approach the world of aerography, with the technical and historical part revised but conceptually unchanged, but also to those already experienced, with the illustrated part of the steps completely new, along with new applications and sections dedicated to airbrush connections with the web and information technology. To spray, squeeze the bottle accordingly. Read the reviews of our customers on Airbrush Kit "BOTTICELLI" of the category Kustom. Review Airbrush Kit "BOTTICELLI" of the brand Aerografando. Trust in the quality and professionalism of Aerografando on the sale of Airbrush Kit "BOTTICELLI", only from us you will find the best prices. 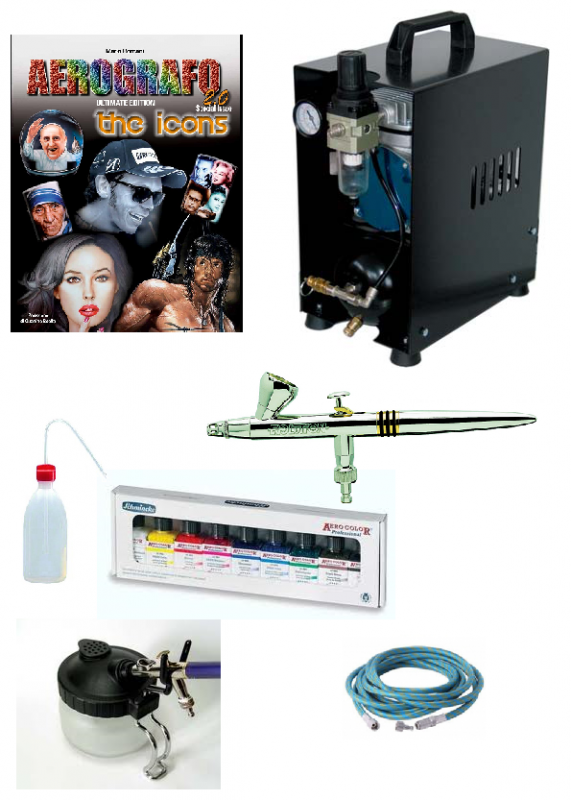 You want to have more details on Airbrush Kit "BOTTICELLI" KBOTTICELLI or more generally on ours Kustom? You are looking for a Kustom but do not you find it in the catalog? Staff of Aerografando will answer all your requests. Notify me of updates to Airbrush Kit "BOTTICELLI"